I went to the presentation on Carson City’s new designs for downtown last night, but because of family matters I was only able to stay there about ten minutes and didn’t get to see the movie itself, or listen to the question and answer segment. But I did grab a handout and see the few video stills they had blown up to poster size. And I watched the video that Dave Morgan put together for his news program, which is available on his web site (no permalinks, though, so click here to watch the streaming video). 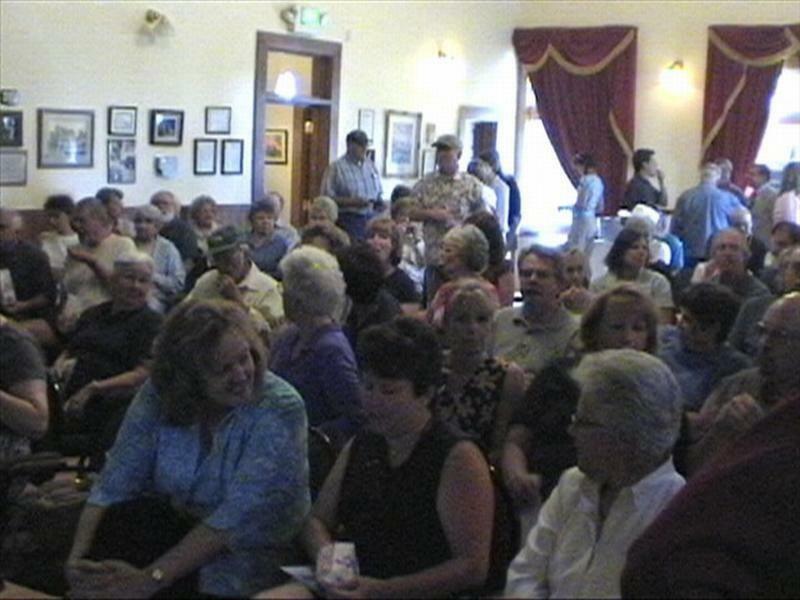 The Bonanza Ballroom at the Brewery Arts Center was packed. But probably the most important thing, for you at home, was the website that was on the back of the handout. There was a typo on the sheet they gave us, but I was able to figure out the URL anyway: www.carsoncityecondev.com/downtowntour. 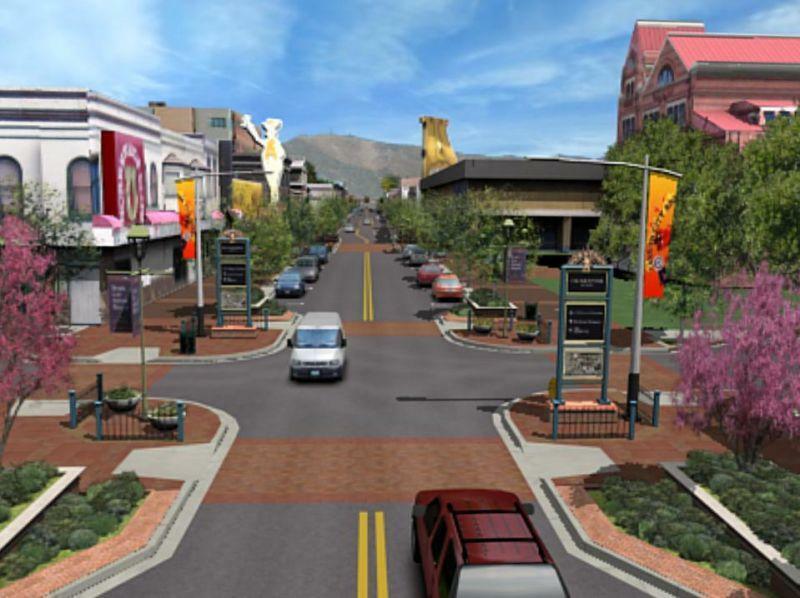 If you go there you’ll find a 2 1/2 minute fly-through movie looking at the new designs for Carson City, as well as four QuickTime panoramas showing the view from various intersections along Carson Street. Ideally I’d like their website to be fleshed out even more than this, but it’s a good start to get the new designs out in front of the people who weren’t able to make it to the Brewery Arts Center this week. There are a lot of good ideas here, and a lot to comment on, and I’m going to try to put together some kind of coverage myself with all the materials I’ve collected. Hopefully I can do it this week, but my track record as a procrastinator is not so good. And maybe tonight I’ll be able to attend the entire presentation instead of having to leave early. 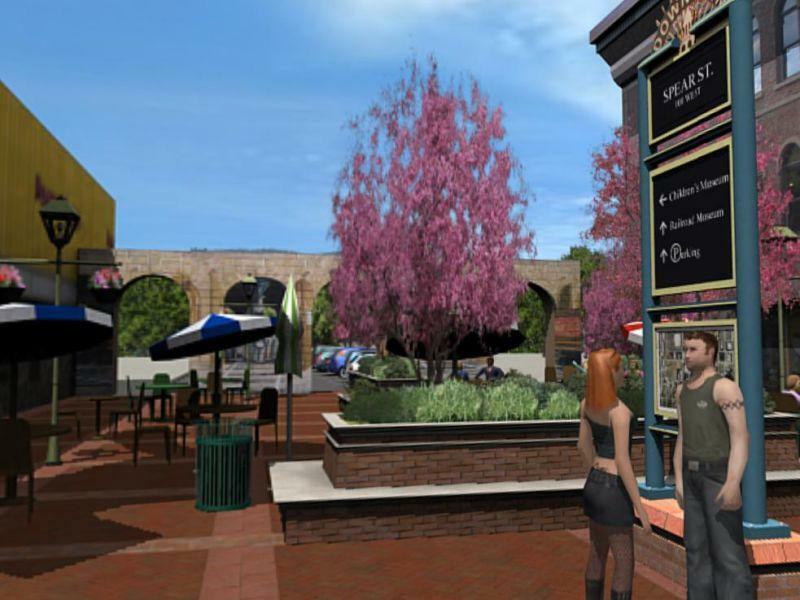 But until then here are a couple of teaser images of Carson City’s new downtown. Looking west from Carson Street down Spear. Cactus Jack’s is on the left. Spear has been blocked off and turned into a public plaza. Apparently prostitution is now legal in Carson also. Check out those fishnets! Looking east down Washington Street. Washington has been blocked off, and the Ash Canyon storm drain (the same one that stopped up a couple of weeks ago) has been daylighted and turned into an urban stream. Looking north on Carson Street from B’Sghetti’s. Lot of changes to the road, the sidewalks, the intersections, the planters, the medians, just everything. But at least it’s comforting to know that the Senator will still be perched atop Cactus Jacks, waving his fistful of money. There was a really good turnout last night, and the room was packed with about 150 people. They’re giving a repeat performance tonight, so if you want to see it you should arrive early to make sure you have a seat. 6pm at the Brewery Arts Center, upstairs in the Bonanza Room. Either they just grabbed characters from The Sims and sprinkled them around town, or they spent some time at Carson High researching outfits. These two are in the flyover video on the website, too, right at the end. 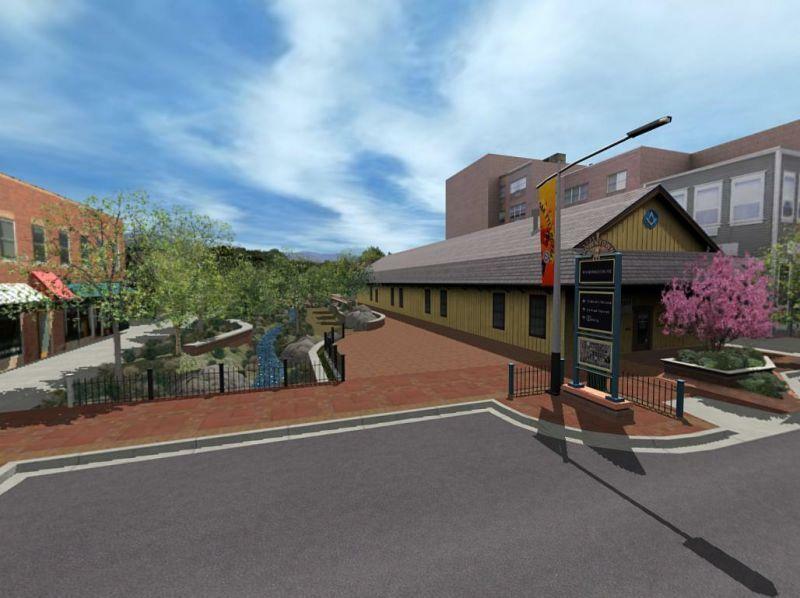 Did you notice in the Video that after Downtown redevelopment, Ash Creek will flow in the opposite direction along Washington Street, uphill towards Ash Canyon? That’s how they plan to prevent future flooding…brilliant! And that all the traffic signals have the green light on top. That’ll help prevent accidents. But at least the Nugget will still have their half pound cheeseburger and fries for $3.50.